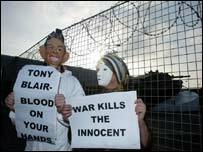 Anti-war campaigners mounted a demonstration outside a Tyneside tank factory to show their opposition to any conflict in Iraq. Wearing white boilersuits spattered with red dye with white face masks, they lay down at the entrance to the Vickers plant in Newcastle on Monday. Police said the protest was peaceful and no arrests were made. The demonstrators confronted workers at the site with leaflets and posters saying "No war on Iraq". Campaigners said they held the protest ahead of the journey of 50 Vickers' tank engineers to Kuwait on 27 February to adapt British Challenger tanks for any proposed invasion of Iraq. One of the protesters, Keith Metcalfe, a 29-year-old charity worker from Washington, Tyne and Wear, said they wanted the workers to "think again" about their actions. He said: "We are trying to reach out to the people working at Vickers and make them realise that their work is going to result in the deaths of thousands of men and women in Iraq. "We are asking the workers to please think about the families they are going to destroy and please think again." The white masks, he said, were worn to "symbolise the unknown people who will never be recognised and whose deaths will go completely unnoticed. "We are saying it's Tony Blair's war. The whole country can't go to war because one man thinks it is the right thing to do." Vickers had no comment to make about the protest.